NEP Solar is a leading developer and supplier of concentrating solar thermal collectors for industrial processes, solar cooling and cogeneration. NEP Solar's PolyTrough collectors generate heat at up to 400° C at high efficiency and at competitive cost. Being able to be roof top mounted allows the NEP Solar solution to be integrated into otherwise unused area. 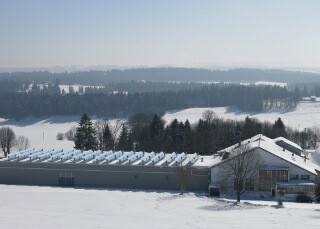 The roof of the Emmi Tête de Moine cheese factory in picturesque Saignelégier, which is at an elevation of 1,000m in Switzerland's Jura mountain range, is now covered with 627m2 of concentrating solar mirrors in the form of 17 NEP Solar PolyTrough 1,800 collectors. 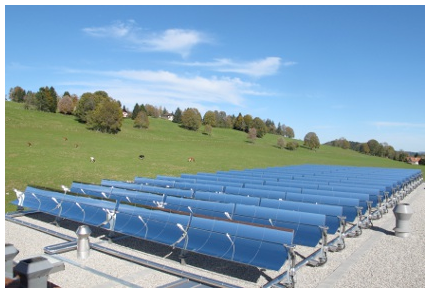 The sun tracking concentrated solar solution was awarded a 2013 Swiss Solar Award. On sunny summer days, the collectors can generate up to 360 kW of concentrated solar energy. This heats a fluid that is used to provide process heat directly to the plant, meeting over 50% of the daily heat demand of the dairy process. Provided in the form of thermal energy rather than electricity, the energy can be directly used for the plant's process heat requirements without loss through conversion. This achieves 60% efficiency, significantly higher when compared to conversion to electrical energy, and allows excess heat captured to be stored for use when the sun is not shining. As temperatures can fall as low as -20° C on winter nights, the fluid is a mixture of water and antifreeze to prevent freezing. During the daylight hours the troughs track the sun, controlled by a Yokogawa solar control system that was designed in partnership with NEP Solar. Via a plate heat exchanger, the fluid in the factory's hot water circuit and storage tank is precisely heated to 120° C for direct utilization in the cheese plant processes. The solar thermal system was integrated into the existing equipment with minimal disruption to the production process. 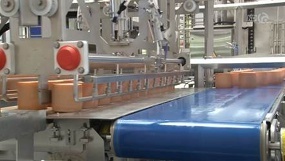 To maximize the efficiency of the NEP Solar solution, troughs with an 89% reflective surface and a high accuracy parabolic mirror are utilized along with an integrated control system that maximizes the gathering of the available solar energy by very accurately controlling the position of the troughs. The solar efficiency collection drops by 1% for every 1/20th of a degree error in the tracking accuracy. Additionally the control system has to allow for wind loading and the effect of snow. In times of adverse weather the troughs can be torn from their mountings if not properly parked. The Yokogawa control system (FAST/TOOLS, STARDOM, HXS10) monitors not only the sunlight but also the weather conditions, including wind direction, and will park the troughs in the appropriate direction to minimize potential uplift and potential damage to the delicate mirrored surfaces. To ensure the optimum tracking accuracy, the troughs are moved fractionally every 5 seconds. The Yokogawa control solution allows the troughs to track from dawn to dusk for maximum use of the available energy resource. 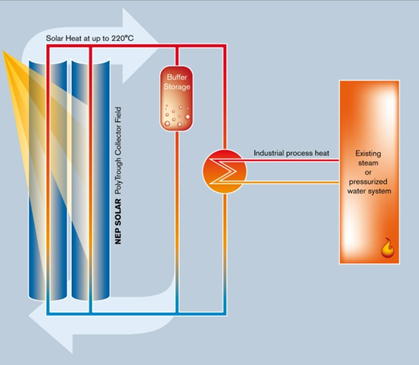 The process plant requests heat from the solar plant at a specific temperature. Depending on the available solar resource, the control system will implement advanced flow/temperature control algorithms developed in partnership with NEP Solar to provide optimum process heat to the plant at all times. As the control solution was developed in Australia in conjunction with NEP Solar Australia, all of the commissioning and optimization work was performed by Yokogawa engineers in Australia, who used a FAST/TOOLS SCADA system to remotely monitor the optimization of the process and make any required engineering changes to the live system. This provided NEP Solar with the ability to have Yokogawa engineers "on site," without incurring the expense of flying them to Switzerland. As noted by Johan Dreyer, MD of NEP Solar, "Due to the time difference, we were able to work at 8 pm in Sydney while the sun was shining in Switzerland and be able to monitor the plant as if we were there." The system implemented at the Saignelégier plant is a third generation solar tracking process solution jointly developed by Yokogawa and NEP Solar. "For the Fromagerie de Saignelégier it was important to not only think, but also act sustainably," says Mr. Jean-Philippe Brahier, Chef d'Exploitation of the Fromagerie de Saignelégier. "The NEP Solar collector field allows us to reduce our fossil fuel consumption by 30,000 litres per year and thereby eliminate 79 tons of CO2 emissions." "We have learned a lot with each project. Due to the flexibility of the Yokogawa solution and the assistance of their engineers, many who worked some very late nights during commissioning, we have found a number of ways to optimize the solution to not only improve the performance but also reduce the costs, which is vital to produce a cost effective solution for the renewables market," noted Johan Dreyer, MD NEP Solar Australia. Stefan Minder, CEO NEP Solar AG: "The project shows that solar process heat can effectively be delivered from industrial rooftops with our concentrating technology and the efficient tracking and control of the process using the Yokogawa control solution. Being developed in Australia and commissioned remotely in Switzerland in the middle of winter, there were problems of course, but due to the flexibility and remote online engineering capability of the Yokogawa solution we were able to have the system optimized and the teething problems ironed out so that we now are able to run fully automatic and only log in when we want to check the efficiency trends being logged on the FAST/TOOLS SCADA." 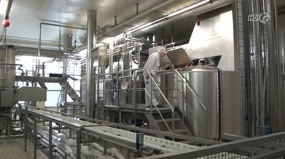 Emmi Saignelégier Factory using renewable process heat.